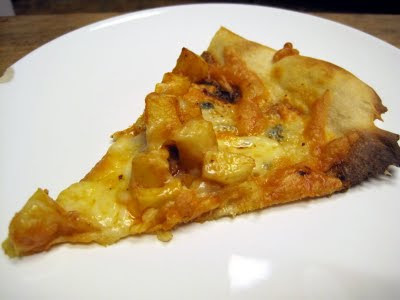 This is one of those totally bizarre but ultimately delicious pizza combinations that really works! The sweet potatoes pair well with the spicy Buffalo sauce, and the blue cheese sprinkled on top adds the perfect tang. You could definitely also make this dish with a combination of sweet potatoes and shredded chicken or only chicken, although I found the vegetarian version very satisfying. You could also make your own Buffalo sauce, or just be lazy like me and buy a jar! One word of warning - although both varieties of sweet potatoes would be delicious here, you might want to go for the orange ones for aesthetic reasons. I bought the white-fleshed sort by mistake and wasn't thrilled with the color when they came out of the oven. (Of course, they get covered in sauce and cheese, but still!) Either way, this is definitely the pizza to make when you're in the mood for something unusual and tasty. 1. Preheat the oven to 375 degrees. Toss the sweet potato with a bit of olive oil, and then spread out on a foil-lined baking sheet. Roast until the sweet potatoes are cooked through and tender, stirring occasionally. 2. Preheat the oven to 500 degrees. 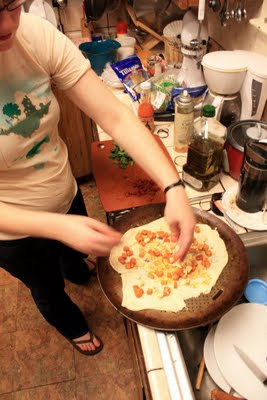 Stretch out one round of pizza dough and place on pizza pan. Brush a very thin layer of olive oil over the crust. 3. In a bowl, mix together the sweet potatoes with Buffalo sauce until well coated. 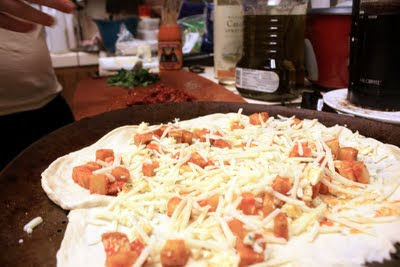 Top the pizza with cubes of sweet potato. Sprinkle mozzarella and blue cheeses over the sweet potatoes. 4. Bake the pizza until the crust is crispy and the mozzarella is brown, about 10 minutes. 1. Mix everything together in the bowl of a stand mixer until everything is just incorporated. 2. Knead on low speed until the dough is smooth and supple. Add more water or flour as needed. 3. Place the dough in an oiled bowl, spray oil on the ball of dough, and then cover with plastic wrap. 4. Let rise until doubled, which could take anywhere from a few to several hours (depending on how fed and how active your sourdough starter is). 6. A couple of hours before you're ready to bake the pizzas, pull the dough out of the fridge and gently divide into 4 or so pieces (less pizzas for thicker crusts, more for thinner crusts). Spray with oil, cover with plastic, and let rise for a couple of hours. 7. Preheat the oven to 500 degrees. Carefully stretch a ball of pizza dough to fit your pan. Top, and then bake until the crust is browned and the cheese is bubbling (cooking time will depend on thickness of crust). Repeat with remaining balls of dough. 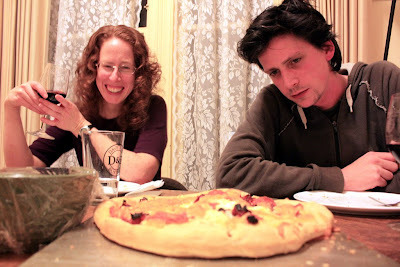 This is pretty unique pizza, kind of sweet and savory at the same time. I like that! What a great sounding pizza!